More information about artist Chung-Hsi Han. "The dark and enlightened parts of the soul are reflected in water". 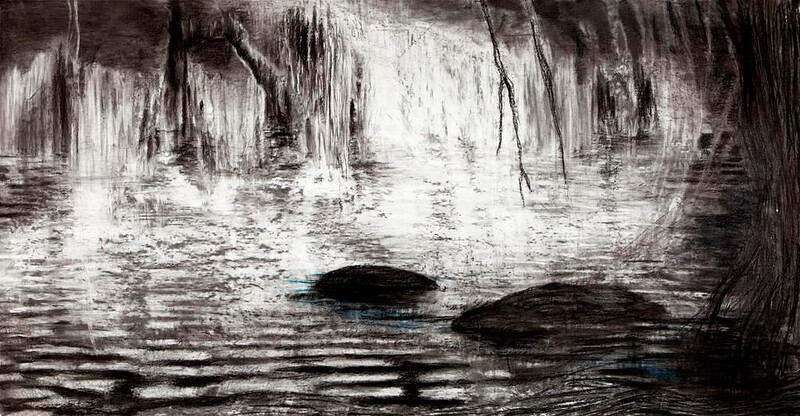 'Metamorphosis', large drawings, suggesting silent spacious landscapes, are obviously his passion. His landscapes are wide and plain without any reference to human presence. Chung uses an eraser to suggest light. In first instance, the erased parts seem pleasantly tangible. However when looking closer it makes a diffuse and almost uncomfortable impression. Under the complex skin of canvas as well as paper resides an urgent inner need. As Chung says, his work originates from a 'Black source' simultaneously strong and mysterious. The start was made at the Royal Academy of Art, The Hague (1993-1997). In 2003 he got a basisstipendium, a grant bij FVBK based on the quality of his work. It was only in 2006 when his main activity became his work on paper. However he keeps on continuing with work on canvas.